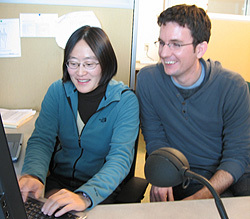 Bioinformatics postdoctoral researcher Jingchun Zhu and graduate student Zack Sanborn collaborated with other UCSC researchers to identify genes lost during human evolution. The evolution of new genes is not the only way for a species to change. The loss of genes may also lead to adaptations that help species survive, but this idea has not been well studied. Now, scientists at the University of California, Santa Cruz, have carried out the first systematic computational analysis to identify long-established genes that were lost during the millions of years of evolution leading to the human species. Their findings appear in the December 14 issue of PLoS Computational Biology. "This is the first study designed to search the entire genome for recent loss of genes that do not have any near-duplicate copies elsewhere in the genome. These are likely to be the more important gene losses," said David Haussler, professor of biomolecular engineering at UCSC. Haussler and five others in his research group--postdoctoral researcher Jingchun Zhu, graduate students Zack Sanborn and Craig Lowe, technical projects manager Mark Diekhans, and evolutionary biologist Tom Pringle--are coauthors of the paper. "The idea that gene losses might contribute to adaptation has been kicked around, but not well studied," said Zhu, who is first author of the paper. "We found three examples in the literature, and all of them could have medical implications." To find gene losses, Zhu employed a software program called TransMap that Diekhans had developed. The program compared the mouse and human genomes, searching for genes having changes significant enough to render them nonfunctional sometime during the 75 million years since the divergence of the mouse and the human lineages. Genes can be lost in many ways. This study focused on losses caused by mutations that disrupt the DNA sequences known as open reading frames. These are either point mutations, where events such as the insertion or substitution of a DNA base alter the instructions encoded in the DNA, or changes that occur when a large portion of a gene is deleted altogether or moves to a new place on the genome. Because the dog diverged from our ancient common ancestor earlier than the mouse, the researchers used the dog genome as an "out group" to filter out false positives, Sanborn said. "If a gene is still living in both dog and mouse but not in human, it was probably living in the common ancestor and then lost in the human lineage," he explained. Using this process, they identified 26 losses of long-established genes, including 16 that were not previously known. The gene-loss candidates found in this study do not represent a complete list of gene losses in the human lineage, however, because the analysis was designed to produce more false negatives than false positives. Next they compared the identified genes in the complete genomes of the human, chimpanzee, rhesus monkey, mouse, rat, dog, and opossum to estimate the evolutionary time when the gene was functional before it was lost. This analysis refined the timing of the gene loss and also served as a benchmark for whether the gene in question was long-established, and therefore probably functional, or merely a redundant gene copy. Through this process, they found six genes that were lost only in the human. One previously unknown loss, the gene for acyltransferase-3 (ACYL3), particularly caught their attention. Multiple copies of the ACYL3 gene are encoded in the fly and worm genomes. "This is an ancient protein that exists throughout the whole tree of life," said Zhu. "In the mammalian clade there is only one copy left, and somewhere along primate evolution, that copy was lost." "In our analysis, we found that this gene contains a nonsense mutation in human and chimp, and it appears to still be functional in rhesus," added Sanborn. The researchers also found that the mutation is not present in the orangutan, so the gene is probably still functional in that species. To further narrow down the timing of the loss, the researchers looked to see if the gene is still active in the gorilla. "On the evolutionary tree leading to human, on the branch between chimp and orangutan, sits gorilla," Sanborn explained. After sequencing the corresponding region in a DNA sample from a gorilla, he found the gene intact, without the mutation, meaning the loss likely occurred in the primate lineage after the speciation of the gorilla and before that of the chimpanzee. In addition to ACYL3, the researchers identified other genes that were lost in humans and did not have any "functional homologues," or alternate genes that could perform the same function, in the human genome. The researchers called these "orphan losses." "A highlight of our research was that we were able to find a list of these orphan losses," said Zhu. "Some of them have been functional for more than 300 million years, and they were the last copies left in the human genome." While the copies of these genes remaining in the human genome appear to be nonfunctional, functional copies of all of them exist in the mouse genome. "These orphan genes may be interesting candidates for experimental biologists to explore," said Zhu. "It would be interesting to find out what was the biological effect of these losses. Once their function is well characterized in species that still have active copies, we could maybe speculate about their effects on human evolution." This research was funded by the National Human Genome Research Institute, the National Institutes of Health, the National Cancer Institute, and the Howard Hughes Medical Institute. Note to reporters: You may contact Jingchun Zhu at (831) 459-5352 or jzhu@soe.ucsc.edu.